11 A None No Power Seat 11 A is a standard Business seat, however, the proximity to the lavatories and galley may be bothersome. 11 D None No Power Seat 11 D is a standard Business seat, however, the proximity to the lavatories and galley may be bothersome. 11 G None No Power Seat 11 G is a standard Business seat, however, the proximity to the lavatories and galley may be bothersome. 11 K None No Power Seat 11 K is a standard Business seat, however, the proximity to the lavatories and galley may be bothersome. 12 A None No Power Seat 12 A is a standard Business seat. 12 K None No Power Seat 12 K is a standard Business seat. 15 A None No Power Seat 15 A is a standard Business seat. 15 K None No Power Seat 15 K is a standard Business seat. 16 D None No Power Seat 16 D is a standard Business seat. 16 G None No Power Seat 16 G is a standard Business seat. 17 A None No Power Seat 17 A is a standard Business Class seat. Users have reported that it provides excellent privacy during the flight. 17 K None No Power Seat 17 K is a standard Business seat. 18 D None No Power Seat 18 D is a standard Business seat. 18 G None No Power Seat 18 G is a standard Business seat. 19 A None No Power Seat 19 A does not have a window. The proximity to the galley can be bothersome. 19 K None No Power Seat 19 K does not have a window. The proximity to the galley can be bothersome. 20 D None No Power Seat 20 D is a Business seat, however, the position of the bassinet and proximity to the lavatory and galley may be bothersome. 20 G None No Power Seat 20 G is a Business seat, however, the position of the bassinet and proximity to the lavatory and galley may be bothersome. 21 A None No Power Seat 21 A is a standard Business seat. 21 K None No Power Seat 21 K is a standard Business seat. 22 A None No Power Seat 22 A is a standard Business seat. 22 D None No Power Seat 22 D is a standard Business seat. 22 G None No Power Seat 22 G is a standard Business seat. 22 K None No Power Seat 22 K is a standard Business seat. 23 A None No Power Seat 23 A is a standard Business seat. 23 D None No Power Seat 23 D is a standard Business seat. 23 G None No Power Seat 23 G is a standard Business seat. 23 K None No Power Seat 23 K is a standard Business seat. 30 A None No Power Seat 30 A has more legroom than the regular Premium Economy seats due to the bulkhead ahead. Also, thanks to the extra space in front, this seat has Business Class type electric legrest and is 20" wide. The tray table is in the armrest, making the armrest immovable and slightly reducing seat width. There is no floor storage for this seat during take-off and landing. 30 C None No Power Seat 30 C has more legroom than the regular Premium Economy seats due to the bulkhead ahead. Also, thanks to the extra space in front, this seat has Business Class type electric legrest and is 20" wide. The tray table is in the armrest, making the armrest immovable and slightly reducing seat width. There is no floor storage for this seat during take-off and landing. 30 D None No Power Seat 30 D has more legroom than the regular Premium Economy seats due to the bulkhead ahead. Also, thanks to the extra space in front, this seat has Business Class type electric legrest and is 20" wide. The tray table is in the armrest, making the armrest immovable and slightly reducing seat width. There is no floor storage for this seat during take-off and landing. 30 E None No Power Seat 30 E has more legroom than the regular Premium Economy seats due to the bulkhead ahead. Also, thanks to the extra space in front, this seat has Business Class type electric legrest and is 20" wide. The tray table is in the armrest, making the armrest immovable and slightly reducing seat width. There is no floor storage for this seat during take-off and landing. 30 F None No Power Seat 30 F has more legroom than the regular Premium Economy seats due to the bulkhead ahead. Also, thanks to the extra space in front, this seat has Business Class type electric legrest and is 20" wide. The tray table is in the armrest, making the armrest immovable and slightly reducing seat width. There is no floor storage for this seat during take-off and landing. 30 G None No Power Seat 30 G has more legroom than the regular Premium Economy seats due to the bulkhead ahead. Also, thanks to the extra space in front, this seat has Business Class type electric legrest and is 20" wide. The tray table is in the armrest, making the armrest immovable and slightly reducing seat width. There is no floor storage for this seat during take-off and landing. 30 H None No Power Seat 30 H has more legroom than the regular Premium Economy seats due to the bulkhead ahead. Also, thanks to the extra space in front, this seat has Business Class type electric legrest and is 20" wide. The tray table is in the armrest, making the armrest immovable and slightly reducing seat width. There is no floor storage for this seat during take-off and landing. 30 K None No Power Seat 30 K has more legroom than the regular Premium Economy seats due to the bulkhead ahead. Also, thanks to the extra space in front, this seat has Business Class type electric legrest and is 20" wide. The tray table is in the armrest, making the armrest immovable and slightly reducing seat width. There is no floor storage for this seat during take-off and landing. 31 A None No Power Seat 31 A is a standard Premium Economy seat that is missing one of two windows. 31 K None No Power Seat 31 K is a standard Premium Economy seat that is missing one of two windows. 39 A None No Power Seat 39 A is an Economy seat that has extra legroom due to the position of the bulkhead however, the proximity to the bassinet may be bothersome. The tray table is in the armrest, making the armrest immovable and slightly reducing seat width. There is no floor storage for this seat during take-off and landing. 39 C None No Power Seat 39 C is an Economy seat that has extra legroom due to the position of the bulkhead however, the proximity to the bassinet may be bothersome. The tray table is in the armrest, making the armrest immovable and slightly reducing seat width. There is no floor storage for this seat during take-off and landing. 39 D None No Power Seat 39 D is an Economy seat, however, the position of the bulkhead may be bothersome. The tray table is in the armrest, making the armrest immovable and slightly reducing seat width. There is no floor storage for this seat during take-off and landing. 39 E None No Power Seat 39 E is an Economy seat, however, the position of the bulkhead may be bothersome. The tray table is in the armrest, making the armrest immovable and slightly reducing seat width. There is no floor storage for this seat during take-off and landing. 39 G None No Power Seat 39 G is an Economy seat, however, the position of the bulkhead may be bothersome. The tray table is in the armrest, making the armrest immovable and slightly reducing seat width. There is no floor storage for this seat during take-off and landing. 39 H None No Power Seat 39 H is an Economy seat that has extra legroom due to the position of the bulkhead however, the proximity to the bassinet may be bothersome. The tray table is in the armrest, making the armrest immovable and slightly reducing seat width. There is no floor storage for this seat during take-off and landing. 39 K None No Power Seat 39 K is an Economy seat that has extra legroom due to the position of the bulkhead however, the proximity to the bassinet may be bothersome. The tray table is in the armrest, making the armrest immovable and slightly reducing seat width. There is no floor storage for this seat during take-off and landing. 40 A None No Power Seat 40 A is a standard Economy seat. 40 B None No Power Seat 40 B is a standard Economy seat. 40 C None No Power Seat 40 C is an Economy Class seat with extra legroom due to the missing seat ahead. However, the proximity to the bassinets may be bothersome. 40 D None No Power Seat 40 D is a standard Economy seat. 40 E None No Power Seat 40 E is a standard Economy seat. 40 G None No Power Seat 40 G is a standard Economy seat. 40 H None No Power Seat 40 H is an Economy Class seat with extra legroom due to the missing seat ahead. However, the proximity to the bassinets may be bothersome. 40 J None No Power Seat 40 J is a standard Economy seat. 40 K None No Power Seat 40 K is a standard Economy seat. 41 A None No Power Seat 41 A is a standard Economy seat. 41 B None No Power Seat 41 B is a standard Economy seat. 41 C None No Power Seat 41 C is a standard Economy seat. 41 D None No Power Seat 41 D is a standard Economy seat. 41 E None No Power Seat 41 E is a standard Economy seat. 41 G None No Power Seat 41 G is a standard Economy seat. 41 H None No Power Seat 41 H is a standard Economy seat that may have limited recline. The proximity to the lavatories may be bothersome. 41 J None No Power Seat 41 J is a standard Economy seat that may have limited recline. The proximity to the lavatories may be bothersome. 41 K None No Power Seat 41 K is a standard Economy seat that may have limited recline. The proximity to the lavatories may be bothersome. 42 A None No Power Seat 42 A is a standard Economy seat that may have limited recline. The proximity to the lavatories may be bothersome. 42 C None No Power Seat 42 C is a standard Economy seat that may have limited recline. The proximity to the lavatories may be bothersome. 42 D None No Power Seat 42 D is a standard Economy seat that may have limited recline. The proximity to the lavatories may be bothersome. 42 E None No Power Seat 42 E is a standard Economy seat that may have limited recline. The proximity to the lavatories may be bothersome. 42 G None No Power Seat 42 G is a standard Economy seat that may have limited recline. The proximity to the lavatories may be bothersome. 43 A None No Power Seat 43 A is designated by Cathay Pacific as a Preferred Seat. An extra surcharge must be paid to reserve this seat. This seat has extra legroom. The tray table is in the armrest, making the armrest immovable and slightly reducing seat width. There is no floor storage for this seat during take-off and landing. This seat is also missing a window. 43 B None No Power Seat 43 B is designated by Cathay Pacific as a Preferred Seat. An extra surcharge must be paid to reserve this seat. This seat has extra legroom. The tray table is in the armrest, making the armrest immovable and slightly reducing seat width. There is no floor storage for this seat during take-off and landing. 43 C None No Power Seat 43 C is designated by Cathay Pacific as a Preferred Seat. An extra surcharge must be paid to reserve this seat. This seat has extra legroom. The proximity to the lavatory may be bothersome. The tray table is in the armrest, making the armrest immovable and slightly reducing seat width. There is no floor storage for this seat during take-off and landing. 43 D None No Power Seat 43 D is an Economy seat, however, the position of the bassinet and proximity to the lavatory may be bothersome. The tray table is in the armrest, making the armrest immovable and slightly reducing seat width. There is no floor storage for this seat during take-off and landing. 43 E None No Power Seat 43 E is an Economy seat, however, the position of the bassinet and proximity to the lavatory may be bothersome. The tray table is in the armrest, making the armrest immovable and slightly reducing seat width. There is no floor storage for this seat during take-off and landing. 43 G None No Power Seat 43 G is an Economy seat, however, the position of the bassinet and proximity to the lavatory may be bothersome. The tray table is in the armrest, making the armrest immovable and slightly reducing seat width. There is no floor storage for this seat during take-off and landing. 43 H None No Power Seat 43 H is designated by Cathay Pacific as a Preferred Seat. An extra surcharge must be paid to reserve this seat. This seat has extra legroom. The proximity to the lavatory may be bothersome. The tray table is in the armrest, making the armrest immovable and slightly reducing seat width. There is no floor storage for this seat during take-off and landing. 43 J None No Power Seat 43 J is designated by Cathay Pacific as a Preferred Seat. An extra surcharge must be paid to reserve this seat. This seat has extra legroom. The proximity to the lavatory may be bothersome. The tray table is in the armrest, making the armrest immovable and slightly reducing seat width. There is no floor storage for this seat during take-off and landing. 43 K None No Power Seat 43 K is designated by Cathay Pacific as a Preferred Seat. An extra surcharge must be paid to reserve this seat. This seat has extra legroom. The proximity to the lavatory may be bothersome. The tray table is in the armrest, making the armrest immovable and slightly reducing seat width. There is no floor storage for this seat during take-off and landing. This seat is also missing a window. 44 D None No Power Seat 44 D is a standard Economy seat. 44 E None No Power Seat 44 E is a standard Economy seat. 44 G None No Power Seat 44 G is a standard Economy seat. 45 D None No Power Seat 45 D is a standard Economy seat. 45 E None No Power Seat 45 E is a standard Economy seat. 45 G None No Power Seat 45 G is a standard Economy seat. 53 D None No Power Seat 53 D is a standard Economy seat. 53 G None No Power Seat 53 G is a standard Economy seat. 54 D None No Power Seat 54 D is a standard Economy seat. 54 G None No Power Seat 54 G is a standard Economy seat. 55 D None No Power Seat 55 D is in the last row of the section and may have limited recline. The proximity to the galley may be bothersome. 55 E None No Power Seat 55 E is in the last row of the section and may have limited recline. The proximity to the galley may be bothersome. 55 G None No Power Seat 55 G is in the last row of the section and may have limited recline. The proximity to the galley may be bothersome. 55 H None No Power Seat 55 H is in the last row of the section and may have limited recline. The proximity to the galley may be bothersome. 55 J None No Power Seat 55 J is in the last row of the section and may have limited recline. The proximity to the galley may be bothersome. 55 K None No Power Seat 55 K is in the last row of the section and may have limited recline. The proximity to the galley may be bothersome. 56 A None No Power Seat 56 A is a standard Economy seat. 56 B None No Power Seat 56 B is a standard Economy seat. 56 C None No Power Seat 56 C is an Economy seat, however, the proximity to the galley may be bothersome. 57 A None No Power Seat 57 A is in the last row of the section and may have limited recline. The proximity to the galley may be bothersome. 57 B None No Power Seat 57 B is in the last row of the section and may have limited recline. The proximity to the galley may be bothersome. 57 C None No Power Seat 57 C is in the last row of the section and may have limited recline. The proximity to the galley may be bothersome. 59 A None No Power Seat 59 A may have restricted legroom due to the protrusion of the exit door. This seat is missing a window. The tray table is in the armrest, making the armrest immovable and slightly reducing seat width. There is no floor storage for this seat during take-off and landing. 59 B None No Power Seat 59 B is designated by Cathay Pacific as a Preferred Seat. An extra surcharge must be paid to reserve this seat. This seat has extra legroom. The proximity to the galley may be bothersome. The tray table is in the armrest, making the armrest immovable and slightly reducing seat width. There is no floor storage for this seat during take-off and landing. 59 C None No Power Seat 59 C is designated by Cathay Pacific as a Preferred Seat. An extra surcharge must be paid to reserve this seat. This seat has extra legroom. The proximity to the galley may be bothersome. The tray table is in the armrest, making the armrest immovable and slightly reducing seat width. There is no floor storage for this seat during take-off and landing. 59 H None No Power Seat 59 H is designated by Cathay Pacific as a Preferred Seat. An extra surcharge must be paid to reserve this seat. This seat has extra legroom. The proximity to the galley may be bothersome. The tray table is in the armrest, making the armrest immovable and slightly reducing seat width. There is no floor storage for this seat during take-off and landing. 59 J None No Power Seat 59 J is designated by Cathay Pacific as a Preferred Seat. An extra surcharge must be paid to reserve this seat. This seat has extra legroom. The proximity to the galley may be bothersome. The tray table is in the armrest, making the armrest immovable and slightly reducing seat width. There is no floor storage for this seat during take-off and landing. 59 K None No Power Seat 59 K may have restricted legroom due to the protrusion of the exit door. This seat is missing a window. The tray table is in the armrest, making the armrest immovable and slightly reducing seat width. There is no floor storage for this seat during take-off and landing. 60 D None No Power Seat 60 D is an Economy seat, however, the position of the bassinet and proximity to the galley may be bothersome. The tray table is in the armrest, making the armrest immovable and slightly reducing seat width. There is no floor storage for this seat during take-off and landing. 60 E None No Power Seat 60 E is an Economy seat, however, the position of the bassinet and proximity to the galley may be bothersome. The tray table is in the armrest, making the armrest immovable and slightly reducing seat width. There is no floor storage for this seat during take-off and landing. 60 G None No Power Seat 60 G is an Economy seat, however, the position of the bassinet and proximity to the galley may be bothersome. The tray table is in the armrest, making the armrest immovable and slightly reducing seat width. There is no floor storage for this seat during take-off and landing. 65 B None No Power Seat 65 B is a standard Economy seat. 65 D None No Power Seat 65 D is a standard Economy seat. 65 G None No Power Seat 65 G has no storage space in the overhead bin since this is the emergency exit for the crew rest area located above. 66 B None No Power Seat 66 B is a standard Economy seat. 66 D None No Power Seat 66 D is a standard Economy seat. 66 G None No Power Seat 66 G is a standard Economy seat. 66 J None No Power Seat 66 J is a standard Economy seat. 67 B None No Power Seat 67 B is a standard Economy seat. 67 D None No Power Seat 67 D is a standard Economy seat. 67 G None No Power Seat 67 G is a standard Economy seat. 67 J None No Power Seat 67 J is a standard Economy seat. 70 C None No Power Seat 70 C is an Economy seat, however, other flyers tend to bump into this seat. 70 H None No Power Seat 70 H is an Economy seat, however, other flyers tend to bump into this seat. 71 A None No Power Seat 71 A is in the last row and may have limited recline. The proximity to the lavatory may be bothersome. 71 C None No Power Seat 71 C is in the last row and may have limited recline. The proximity to the lavatory may be bothersome. 71 H None No Power Seat 71 H is in the last row and may have limited recleine. The proximity to the lavatory may be bothersome. 71 K None No Power Seat 71 K is in the last row and may have limited recline. The proximity to the lavatory may be bothersome. 72 D None No Power Seat 72 D is in the last row and may have limited recline. The proximity to the lavatory may be bothersome. 72 E None No Power Seat 72 E is in the last row and may have limited recline. The proximity to the lavatory may be bothersome. 72 G None No Power Seat 72 G is in the last row and may have limited recline. The proximity to the lavatory may be bothersome. Audio on Demand service is offered to all passengers on long-haul aircraft. Passengers may choose from up to 888 CD albums in 24 different genres. Audio books are also available. Click here for more information. In all classes on long-haul aircraft, more than 100 movies are offered each month on the AVOD (Audio/Video On Demand) system. Click here for more information. All Classes of serivce offer a 110V AC power port to charge any electronic device. As of early 2019, Cathay Pacific is working on bringing WiFi to all of their 777-300ERs. Cathay Pacific has six of this Boeing 777-300ER with new Business Class (3 Classes) aircraft in its fleet. This plane seats a total of 340 passengers. All First and Business Class seats are suitable for passengers with reduced mobility. In the Economy Class, aisle seats are also suitable for passengers with reduced mobility, except for the front rows. Seats are designed with their own shell and slide forward instead of reclining into the seat behind. The lavatory behind 12 K is handicap accessible. On this aircraft, most bulkhead seats are often designated as bassinet locations. The back three rows of seats in this plane are used for unaccompanied minors. Noise from the galley could be bothersome during the long flight as I was woken up 2hrs before landing, but since it's a 5pm - noon flight, this is less annoying than if it were teh 12:30 - 07:00 flight where you would want maximum sleep before arriving in HK. Clumsy air hostess knocked over a whole trolley at the beginning of the flight and a lot of liquid rushing towards the corridor didn't help either as carpet was wet. Constant opening of cupboards can also be annoying. However, during my 6hr sleep it was quiet. Would advice choosing row 15 and beyond if possible. I picked this seat HKG to LAX because flight guru showed the plane was the 4 class version where this row was behind first class. Instead, we were first row business. The seat itself is good with several areas for storage. The proximity to the closets the crew kept using made sleep difficult with constant noise. The service was terrible. Drink pours were minimal. They never came back after initial meal. When I went back and asked about mid-flight snacks, I got a quizzical look and was offered a box with some peanuts or sun-dried tomatoes. Flight over was on EVA where the service was fantastic and bed much more comfortable. Headphones on EVA were noise cancelling-Cathay were not. Unimpressed with Cathay Pacific. There are now quite a few 77Ws converted to four abreast . The seats are the narrowest of any airline with ten abreast 777 seating . They are ridiculously narrow . The version I flew on 2018-08-09 had the new 3-4-3 10-across seating. I had chosen 42G based on a different plane but they switched to this. It not only has very limited recline and is directly across from a toilet, its pitch is less than others and it's noticeably closer to the seat ahead. I asked to be moved which they accommodated. The seats themselves were fine and theyve updated the IFE with bigger screens and the A350-style user interface. Please forever avoid every CX 777 from now on. They are being refitted with 10-across seats right now. The seat comfort will deteriorate to completely unacceptable levels. Just please, avoid this. Only the A350 is comfortable in all of CX. I was seated slightly behind this seat. This section of business class is disappointing. This seat has no window, only behind. This seat should be shown as red not yellow. Should point out this was the three section configuratio with no first. There is a large bulkhead directly in front of the seat. It is the same shape as a standard bus class seat, but goes to the celing. Not a pleasant experience. Overall the second section of bus-class seems a poor second. Even though CX's 777 economy seats are in 9-across configuration, I have to say it was one of the worst flights ever. The legroom was so bad my knees were pressed up against the seat in front, and the padding is so thin the seat felt almost like rock, and that you could feel the person from behind moving their legs. Not to mention the IFE is very slow and unresponsive and the AC outlet is very weak and takes forever to charge devices. Even though CX's 777s are not the oldest, Boeing did nothing to improve its interior and thus it looks very dated (the yellow cabin lighting made it much worse), and also the cabin noise is so unbearable. For those that travel between Toronto and Hong Kong you need to avoid this plane by transiting in Vancouver through CX856/859 with their wonderful A350. I have been on Finnair and Singapore Airlines' A350 and they were so comfortable that I never want to be on the 777 ever again. This seat had me pressed right against the wall and seriously impinges on left elbow room. To make matters worse, there is a pocket on the wall with reading materials and headphones that sticks out which hits me squarely in the face in the upright position. While it isn't a big deal not having a window, there is strong draft coming from the exit door seams constantly throughout the flight and makes a whiny sound. Was placed in this seat because nothing else left. Definitely do not pay extra for this seat. Would much rather be in 71H over 43A. MAD to HKG, Seat 54 H. All three seats in this group did not recline. Not sure if this was due to a mechanical probkem, or if their recline was deliberately restricted to keep from intruding into the seats in Row 55 behind, which themselves may have been restricted due to the bulkhead behind them. No window - seat very narrow - constant draught from emergency exit. Had to pay extra for this seat - should have had a discount. From MAD to HKG. Seat was not that wide but enough to sleep well. AVOD service was very good, since I'm from S.Korea, KOREAN was available in the menu. Meals were fine. HOWEVER, it took a long time to alight from the aircraft. 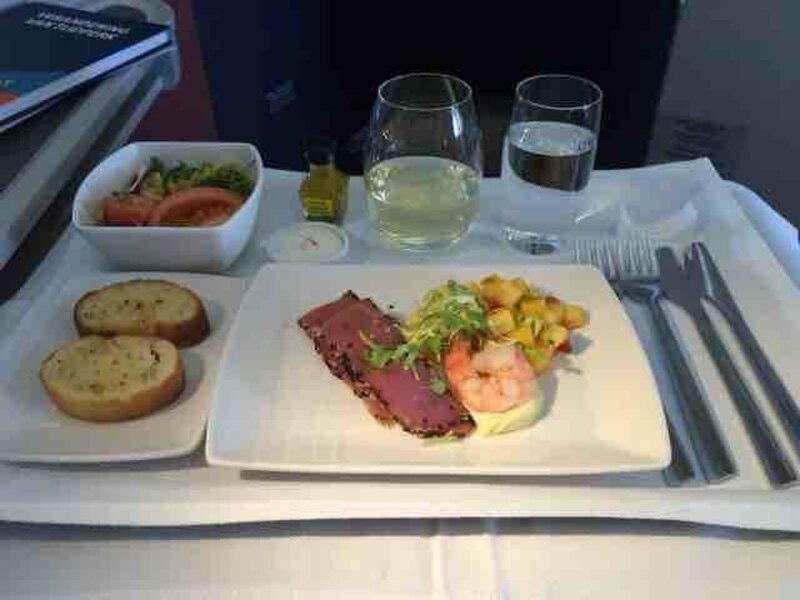 First of all this was one of the best airlines ive flown with,food was good and service was fast and courteous. The day i flew there were a lot of empty seats and most of us in the back had whole rows to sleep. Bathrooms therefore were clean and no waiting! Overall a very good experience for a long haul flight of 16 hrs! On my flight from HKG to JNB I found seats 12D and 12G to be very good, if not the best on the plane. They are in the forward cabin which is a bit larger, but there was no problem with noise or such from the galleys, since the seats in row 11 sort of shield the noise from coming in. The seat is quite comfy in the normal takeoff/landing position, but is even better in the lie flat position. IFE was mostly OK on this flight, with a pretty good selection. Crew were very friendly, food was nice, and armrests were very large, and would allow even the biggest laptops to fit in perfectly. The toilets at the front of the plane are very clean, since few people use them. Very good seat, and nice flight. Would fly C.P. again! This is the worst seat i have had on a flight in 40'years of flying. The coldest, noisiest seat. Just like sitting out on the wing. There is no window and there is a magazine rack stuffed with junk right in your face on the wall. They charge you an additional $150 for this seat which is a travesty. A terrible seat at no upcharge. Recently flew from JNB-HKG and 12K is a great seat- as is the case with all of my experiences on CX Business Class, long-haul flights. 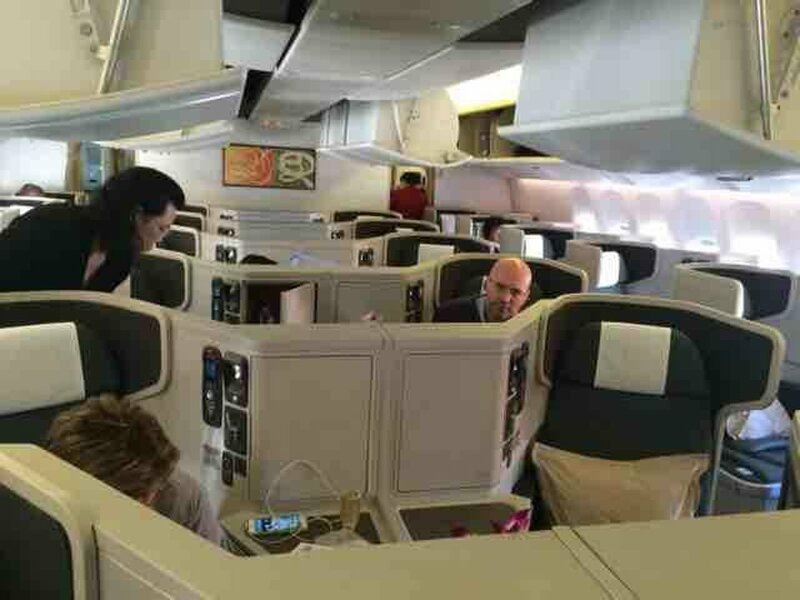 Very little traffic as there are two separate Business Class cabins on this aircraft, and not many passengers use the two restrooms in the forward area of the plane. The service and meals are exceptional, and the flat bed is extremely comfortable. The blanket has been updated since I last flew CX, and is heavier and larger. Plenty of storage to the side for many items, as well as deep overhead bins for luggage. CX's service is so far ahead of US carriers; polite, sincere and welcoming. Your review is correct, no window and a lot of gallry noise, avoid. HKG to SFO, seat 23K. A really good seat. This is the last row of the smaller, rear business class section. There is a barrier behind this row separating business from Premium Economy, so there is virtually no traffic past this seat. The only downsides would be that you will be served last (not a big deal), and that all the lavs are on the other aisle. 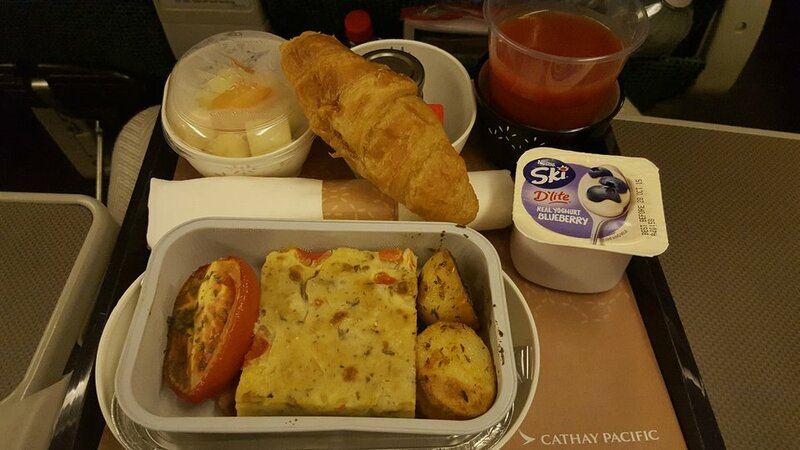 As per usual, excellent Cathay Pacific service and food. Very good seat in the premium economy cabin as it balances accessibility to the aisle and good window view. The only setback is that the lavatory situates in the economy cabin, in which case you need to walk back and queue up with passengers there. This is a bad seat. The leg room of the 68H is reduced because this row is not parallel to the normal row, so the 68H is much closer to the row 67 than 68K. Was appr. 5/7 cm difference! This because the tail of the flight starts there. I assume the seat 68C has the same problem. On the 3 class 777's from CX, the Premium Economy Cabin is four rows deep and 8 seats across. Seat 33K is in the last row of the PE cabin, and reclines as much as any other PE seat in that section. It has 2 windows, one at the shoulder, one at the knees. Tray tables are in the arm rest, therefore the armrest between J & K is fixed. There is plenty of width and leg room; there is a footrest that can be folded down if you are short and need to rest your feet on something to make it more comfortable. The IFE is fantastic, and is on a significantly larger screen than in Economy. If you want to use your own earphones, you will need a 1 female/2 male adapter for them to work. This is well worth every penny for it has plenty of leg room as a bulk seat. This is the way forward for it is almost as good as business class & made a ten hour flight seem almost a breeze! 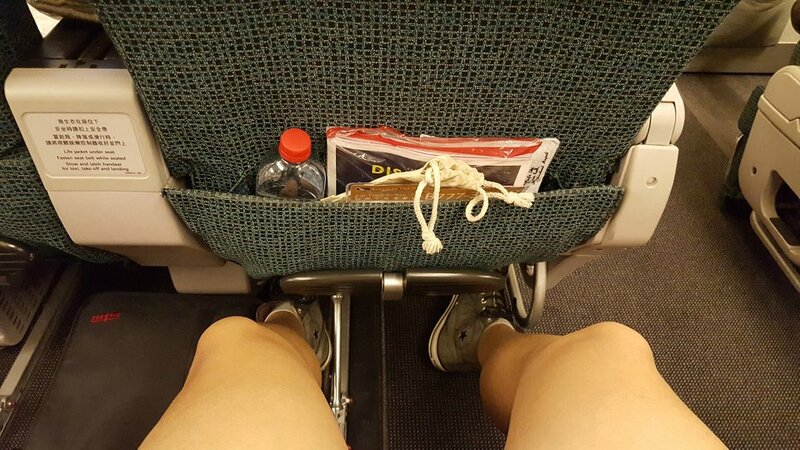 I PAID for extra leg room on this flight from Hong Kong to San Francisco (California, USA). This is a seat close to the frame of the aircraft. I saw "FRAME" because you do not really have a window. The seat is positioned at the aircraft exit. So you dont have a bin over your head. If you are a woman, please note you do NOT get to keep your pocketbook or anything on your lap during take off or landing. If the bin (slightly above you is full), your pocketbook may be stored down the isle in a bin out of your sight. This is a long flight. The flight crew did not inform me that i had aTV for my seat. FYI - Its tucked between the seats. I had a C (isle seat) when I travelled to Hong Kong. They did not tell anyone in the row about the TV access on that flight either. Another passenger told me when i landed. The seat is right in front of the bathroom. So for 11 hours you have steady bathroom traffic of people in and out, the bright light in your face when they open and close the door, a line of people (some leaning on the exit door) and others pushing and pulling the door even tho the sign shows occupied. The seat is beside the "Baby row". So you may have crying babies on the flight. My biggest complaint about this seat and the flight crew is that this seat makes your right leg very cold. Its right at the door so despite my sweat pants i had a stead flow of cold air on my legs. This made my legs numb, even with an extra blanket. I did not sleep, and I was uncomfortable the entire flight. What made this very extremely insulting, is that there are thicker blankets on aboard the aircraft that the flight crew could have been provided. By now, they must be aware of the temperature in that side of the plane to provide thicker blankets. This seat was perfect, as the seat reclined quite a way back and did not interfere with anyone behind cause of the galley bulk head. No problem with the galley or stewards with their trolleys. Will book this seat again. Seat 17A is a really good Business Class seat. I like the privacy. But one thing is that the seats clearly ar not designed for short people, the seat isn't really comfortable in upright position. Seat 30K for 15 hours from HKG-EWR was very good. I love that compared to US airlines, premium economy is ACTUALLY premium. Seats are wider, have better legroom and better recline. 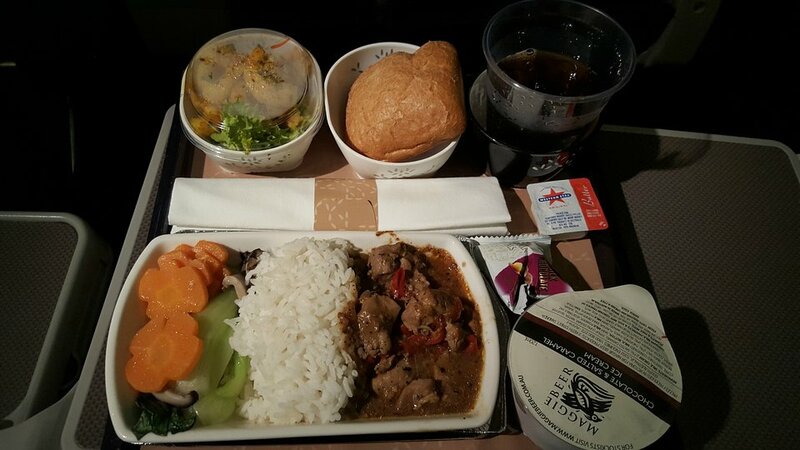 The food was very good and the flight attendants were pleasant. I think of all the P.E. seats, only row 30 has a footrest. These seats are reserved for baby bassinets usually but we managed to snag these seats. We were able to use the bassinet as a 2nd tray table to put a laptop to watch movies that were not available on the IFE, not that the IFE was bad by any means. Also, the outside view on the IFE is a cool feature! Bad Seat Although this seat may have extra legroom, the storage space is extremely limited as you have to share a small wall storage space with 43B and the overhead bin is also shared with row 44. The proximity to the toilet is also very annoying as the light that escape out when people use it during the middle of the flight is disruptive to sleeping. It can also get very cold by the exit at 35000 feet as the cold air seeps in. There is also significant leaking problem through the door on the ground when it is rainy. I was actually booked for seat 31A but as the flight was not very full was told I could sit anywhere in Premium economy. I found the seat extremely uncomfortable, even though the seat next to me was vacant, in that it could not be moved to a reclining position and also that the armrests couldnt be lifted. Spent an extremely uncomfortable night with virtually no sleep. Pity none of your seats recline or the armrests lifted. No overhead locker over this seat (or its counterpart 11D) and the next locker is a half size one, usually already full with crew items. You therefore need to share the locker over 11K or 11A, which in my case, didn't go down well with the person in that seat. Flew from Toronto to Hong Kong in Economy. Seat pitch and leg room were reasonable. PVT's had a good selection and cabin service was great. This is a bad seat even though it is an exit row. Because there are only 2 toilets to service premium economy and the front part of normal economy there is always someone bumping into you or crowding the space. It was rare that I could stretch my legs. 43A would be better as there is no exit door bulkhead. Will not book this seat again! This seat may have extra legroom but with no seat in front of you there is nowhere to put any of your things - book, magazine, iPad, laptop. As there's no seat or bulkhead there's no pouch to put anything. On a long haul 14 hour flight I found this a big problem and ended up just having to either squeeze stuff down the side of the seat (I lost my phone down there at one stage and the stewardess had to take the seat apart to find it) or just sit it on the floor for people to potentially stand on. not worth the extra legroom. this seat was sold to me on check in as an 'exit row seat' which it definitely is not! LHR - HKG. One thing to note in 33D (and 33G) is that unlike the back row of PE in a Qantas A380 (for example), the bulkhead behind row 33 does not extend to the full width of the 4 centre seats - it runs from about halfway from the 33D seat to halfway to the 33G seat, resulting in these two seats getting bumped quite a bit from people coming from the economy section. I was in 11A on short flight from Hong Kong to Manila and found it rather confining. Being slighly claustrophobic the fact that you had a bulkhead in front of you made the space feel much smaller than it really is. The same would apply to 11K on the opposite site side. On long flights this would become uncomfortable but short flights are fine. The centre seats are not affected in this way as there is a storage facilty in front of the seats that rises to only a meter off the floor thus providing a flat surface for passengers to place small items during flight. The storage area is roughly 30 cm deep so it has the effect pushing the bulkhead further away when seated therefore providing the effect of greater space in the middle seats. Cathay Pacific flies 5 versions of Boeing 777-300ER.